Colleges around the country are sending the “speech police” to “educate” students on the proper words to use, so as not to offend one group or another. Any word that could ever be used to describe a person – like “crazy” or “thug” or “chick” might offend someone, somewhere, so students should use other terms. It’s all part of the “#JustWords” campaign they’re rolling out at the University of Wisconsin at Milwaukee, Heat Street reports, and mimics similar programs at UC Davis and elsewhere. All of these words and phrases (and there are many, many more, like “welfare queen,” “man up,” “ghetto,” “illegal alien” and “no homo.”) are “microgaggressions,” tiny offensive things that white people utter on a regular basis that are rooted in discrimination and racism. They’re like a death by a thousand cuts, people say, eventually damaging the psyches of minorities. Of course, social justice warriors will insist that they’re not going to require people to use these new terms – they’re completely supportive of free speech. They just want students to know how they’re hurting everyone’s feelings when they say mean things. 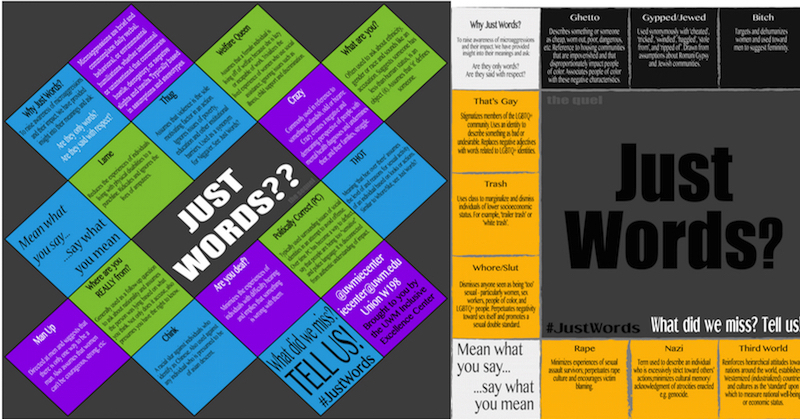 Through “Just Words?”, we seek to raise awareness of microaggressions and dismissive terms, their impact, provide an insight into their meaning. We are not seeking to tell people what they can/cannot say. 1) As in only. Are they really only words, that is to say they carry no weight or added meaning? 2) As in justice. Are they said from a place of respect or belief in fairness, will it aid in creating a just culture? Phase 1 is the poster campaign, this is passive programming. Phase 2 will include active programming in which we invite UWM campus community members to engage in conversation (hopefully critical dialogue) about micro aggressions and the campaigns. They will be facilitated by IEC staff. What exactly does “active programming” mean? Is that brainwashing? Sounds a lot like brainwashing to me. By the way, the director of the Milwaukee School’s “Inclusive Excellence Center, Warren Scherer, doesn’t seem to have a problem mocking Jews and throwing obscenities around on Twitter. Ari Cohn, a free speech lawyer for the Foundation for Individual Rights in Education, says the University should tread with caution.